Are there rendering differences between actual iOS device and Litmus? 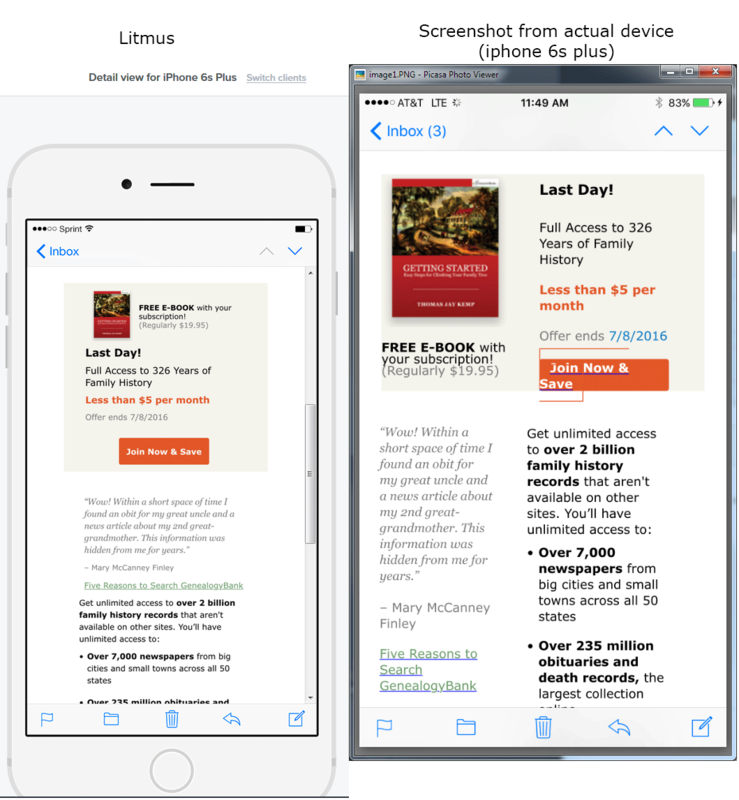 Litmus has been showing my emails on iOS devices correctly for some time now, but recently I was alerted to the emails looking broken on actual devices. Here is a screenshot! Has anyone noticed this recently? I checked the email on an ancient ipod touch (ios 5) and it displayed correctly, how litmus shows it, so I'm wondering if there was a recent ios update that messed up rendering? How is the email address connected to the iOS Mail app? I know that emails received through Microsoft Exchange Server do not support responsive emails, even if the email client app itself does. I'm not so sure it's an outlook exchange thing, although we do use outlook exchange at the company I work for. When I look at it in my ancient ios5 ipod touch either sent through gmail or through outlook exchange, the media queries work as expected. Unfortunately I don't have access to any more modern devices right now due to the holiday and vacations. Thanks so much for the suggestion though, I really appreciate it! If it is an outlook exchange problem however, is there a setting within litmus that I can pick to show that on the checklist screen? There isn't a setting, that I know of. If it's working on a different device though, then it must be something else. Actually... looking again at the screenshot from the actual device above, is that email a direct send from an ESP? I notice that the links have blue underlines (when obviously they shouldn't based on the Litmus screenshot), and I have only seen that happen sometimes when emails get forwarded. Oh my, how embarrassing! That's exactly what it was, someone had sent me a fwded version and not the actual version. It's looking correct in all subsequent tests. Thanks so much for your help, it didn't even cross my mind that's what was happening! I've not seen any issues lately. Got a code sample to try out? Hi, here is a codepen with my code (images aren't working but you get the idea). Things I've read say that maybe this is the culprit? that there is a bug ios9 as respects that. i've tried other ways to write that but the same results. But regardless, this is very difficult to troubleshoot when litmus is showing me that everything is fine!